The site has been associated with the Royal Navy since 1622, when Wallingford House, built on what had once been the timber yard of the old Whitehall Palace and later part of the Tiltyard, was sold by Viscount Wallingford to George Villiers, who had become Lord High Admiral three years earlier. The Lords Commissioners appointed to fill the office after Villiers was assassinated in 1628 continued to meet there until 1634. The site became available again in 1694, and was acquired by the admiralty for a new Admiralty Building. Sir Christopher Wren prepared a report (long lost) for the Lords Commissioners, who it appears failed to take his advice, getting a building put up quickly and cheaply. Too cheaply: within twenty years it was falling apart and the cost of constant repairs became so excessive that the building had to be pulled down. Thomas Ripley was given the task of erecting a new and more substantial building, which was ready for occupation, if not fully complete, in 1725. It has proved durable, surviving fire, explosion, and the Blitz. When the Lords Commissioners met for the first time in the Board Room, its windows looked out over Spring Gardens, part of the old pleasure grounds of the Whitehall Palace, bestowed on the Admiralty by the King, and across St James Park. There was space enough for shady walks and box hedges, for stables to provide their Lordships with transport, and a patch of grass where a cow was quartered and fresh milk could be obtained. The gardens had two fine summerhouses, which would be sold when more space was needed and the gardens were built over, and still survive: one, designed by the architect William Kent, a stone’s throw away in the gardens of Buckingham Palace; and the other, purchased along with the garden’s sundial by Earl Spencer, who had been First Lord of the Admiralty in 1892, at Althorp, where it now serves as a shrine to Diana, Princess of Wales. 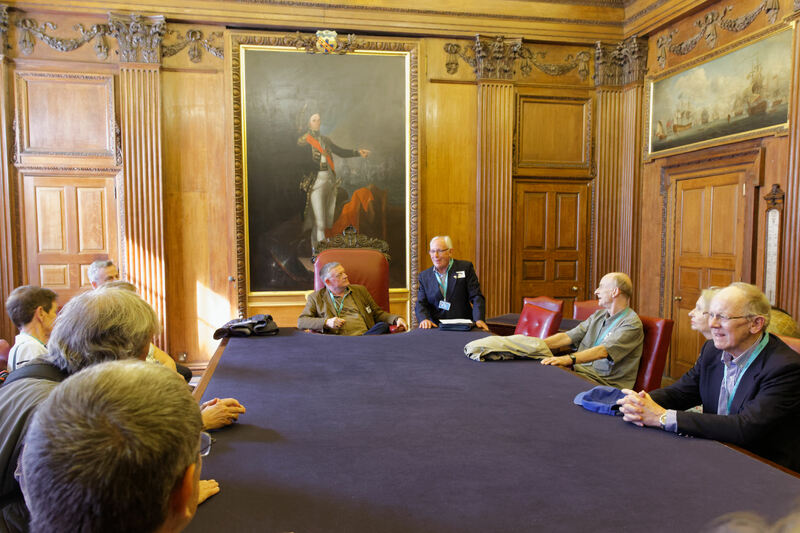 The Board Room was the most important room in the building, the place where the Admiralty Board held its meetings and the most important official business was done, where officers came to make their reports and receive their orders – it is the brain and the heart of the Navy. The oak panelling and the fine wood carvings are thought to be older than the room itself or even than the building: during restoration it became evident that the panelling had been cut and adapted to fit a new site, but one similar in size to the original. It seems probably that they were too good to be lost and were rescued from the older, 1695 building. The festooned frieze and the frames over the doors were added for this room. To the left of the fireplace a small ivory spot has been let into the oak fluting, at 5’4’’ inches from the floor – the regulation minimum height for an office in the royal marines. It has often been claimed that it commemorated the height of Lord Nelson, but Nelson was actually about 5’6’’: not tall by modern standards, but an average height for the period, although he was dwarfed by his flag captain. Thomas Masterman Hardy, who was 6’4’’ and heavily built. The carvings above the fireplace are exceptionally fine, and are thought to be by Grinling Gibbons. The carvings are full of naval emblems – dolphins, tridents and fish. The centrepiece is the Admiralty anchor surrounded by oak, palm and bay to represent victories by land and sea, the wings of victory and the trumpets of fame, the Royal Crown with the sword and sceptre for power and justice, all surmounted by the Eye in Glory which was an emblem used by the Stuart monarchs to represent the divine right of kings (it is a left eye, looking upon thins temporal. The right eye was absorbed with things eternal, and is the Eye of Providence. It is the right eye which appears on the Great Seal of the United States, to represent to God watching over America). All the details indicate that the carvings were prepared for James ll, who was also Lord High Admiral, rather than for the Hanoverian kings. The fireback within the fireplace itself bears the arms and initial of Charles ll. The most unusual feature of the carvings is the extraordinary collection of nautical instruments represented amongst the fruits and flowers, which include a telescope, cross-staff, compasses, astrolabe, back-staff and quadrant. Many have moving parts and are so detailed that a scholar in the 1920’s, Professor Knobel, though some of them not just carvings but actual examples of 17th century instruments used for navigation. Those would not have been carved from pearwood (too fragile for daily use at sea), but surviving examples of many of these instruments, are now so rare that these carvings are important to the room from which seamen like James Cook, Matthew Flinders, Franklin, Vancouver, Parry, and so many others were sent out to chart the globe; and to the room where the Board of Longitude met to seek a solution to one of the most difficult problems in the history of cartography: keeping track of longitude at sea. It was a problem finally solved partly by astronomers but largely by the brilliance of John Harrison and his invention of the first practicable marine chronometer. James Cook trialled the first chronometer, K1, made to Harrison’s pattern which proved that Harrison’s work could be replicated, on his second and third Pacific voyages, while the second was taken on HMS BOUNTY by Bligh, and had to be retrieved from the mutineers on Pitcairn. Harrison argued his case in this room, Cook received his orders here, Bligh made his report to the Lords Commissioners of the Admiralty here. The magnificent wind dial over the mantelpiece dates from 1708 and is another survivor of the older building. It was attached to a weather vane on the roof, and allowed their Lordships to know at a glance whether the wind would serve to bring ships up from the anchorage at the mouth of the Thames, or to set sail. 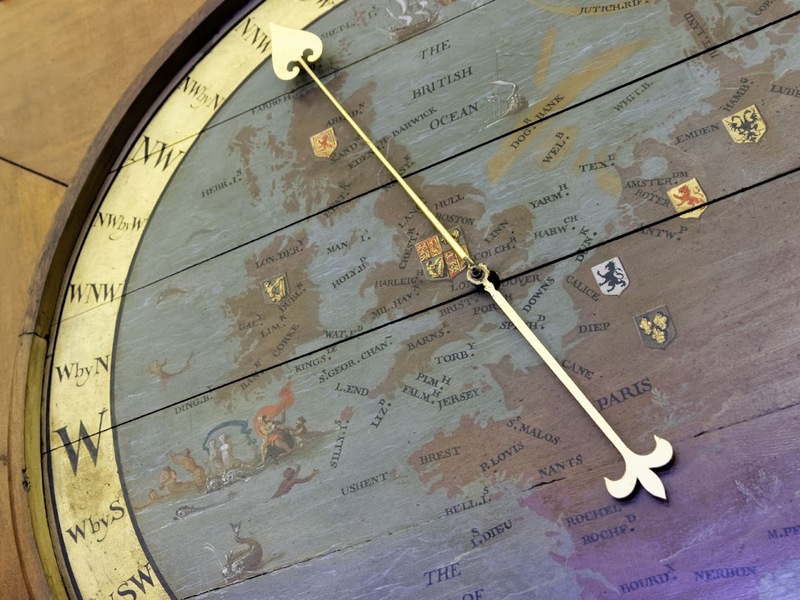 It was a matter of critical strategic and commercial importance in the age of sail: there is a similar wind dial made for William lll at Kensington Palace, where Peter the Great saw it in 1698; and another dominated the Underwriters’ Room at Lloyd’s. The map of the British Isles which decorates it is possibly derived from an atlas by de Witt. It is very like the map on the Kensington Palace wind dial, and it is possible that both were made by the same man. Robert Morden was paid £5 for the King’s dial. The Admiralty dial remained in use until the 1880s, although after the advent of steam it had lost its former importance. Then one afternoon the dial oscillated so wildly that a Board meeting was abandoned while their Lordships streamed out into the garden to discover what extraordinary atmospheric phenomenon could be causing it. Not weather, they found, but an errant clerk, clambering on the roof. The vane was disconnected forthwith. The clerk, however, proved to be a talented climber, and retired in 1904 as Sir Richard Audrey KCB, Accountant General of the Navy. The wind vane once shared the roof with a shutter telegraph, linked by a chain of signalling stations constructed in 1796 to Portsmouth. In good visibility during daylight, it could convey a message between from one end of the line to the other in under ten minutes. It was replaced in 1822 by a slightly longer chain of semaphore telegraphs, which remained in use until 1847. If not the most flattering portrait of Nelson, Guzzardi’s may be one of the most honest, showing him in the aftermath of the Battle of the Nile (1st August 1798): he had received a wound above the eye, sustained concussion, and looks in fragile health: he continued to suffer headaches and nausea from the head-wound for months after the battle. His hat is tipped back to prevent discomfort to the scar which is visible on his forehead. It is the first portrait to show him with the diamond chelengk, presented to him after the battle by Sultan Selim lll of Turkey, on his hat; and on the chair beside him is a scarlet cloak lined with sable, which was another of the Sultan’s gifts. Nelson gestures towards a scene of the battle behind him. The portrait was painted in Palermo for Sir William Hamilton, and inherited by his nephew Charles Goreville. Greville’s nephew, Colonel Robert Fulke Greville, inherited it in turn and hung it in the Assembly room in a hotel on his Pembrokeshire estates at Milford Haven, where it was seen by the Admiralty’s Head Messenger, who brought it to the attention of Admiral Baillie Hamilton, the Second Secretary, when the Board Room was being cleaned and refurbished. The portrait had since been ‘dismounted and laid aside’, and when the Secretary inquired about it, Greville presented it to the Admiralty in 1848. It was restored, enlarged to match the painting of William lV, and reframed (by Mr John Peel, at a cost of £86 one shilling and tuppence) and hung in the Board room in 1848. A copy was made of it and presented to Colonel Greville, which eventually found its way to Britannia Royal Naval College in Dartmouth. Other versions exist: Guzzardi himself made several copies (there are in all five signed versions, all dated 1799, one painted for the Neapolitan royal family, others for Nelson, to be presented to friends): the later version show Nelson wearing the Turkish Order of the Crescent and two further gold medals which were not received in Naples until after august 1799. This original version must have been painted in the first half of the year. The space now occupied by the portrait was previously hung with charts on rollers, and the portrait was and is still hinged, leaving a plain space behind it, presumably so that charts could still be hung there if the Board required them. The last time this facility is actually known to have been put to practical use is for a Board meeting on 13th September 1950, when Lord Fraser had the drawings for a new class of frigates pinned up behind the portrait, and when the subject came up on the agenda had the portrait swung back, with a flourish, to display them. The Board purchased the portrait of William lV, the ‘Sailor King’ in 1847, shortly before acquiring the portrait of Nelson which faces it. The future king, who had two older brothers and was not then expected to inherit the crown, joined the Navy as a midshipman at the age of 13, and had served at the Battle of Cape St Vincent and during the American War of Independence. He served under Nelson, and the two became good friends: the prince gave the bride away and signed as a witness when Nelson Married Frances Nisbet in 1787. The prince was made Duke of Clarence in 1789, and his active service at sea came to an end in 1790. However, in 1827, when his elder brother the Duke of York died and he had become heir presumptive, he was appointed to the office of Lord High Admiral, which had been in commission (its powers exercised by the board of Lords Commissioners of the Admiralty) since 1709. He held the office only briefly, having repeated rows with his Council of Admiralty officers. When he took a squadron of ships to sea and disappeared for ten days without telling the King, the Prime Minister (then the Duke of Wellington) or anyone where he was going, it was too much, and he was obliged to resign. The office was put back into commission and remained so until the creation of the Ministry of Defence and the assumption of the office by the Queen. It was under the eyes of this portrait of the last royal Duke to serve as Lord High Admiral that the Duke of Edinburgh, following his 90th birthday, received his Letters Patent from Her Majesty and was instituted as our present Lord High Admiral on 23rd November 2011. The red facing on the cuffs of the uniform worn by the King in this portrait reflect a change in flag officers’ uniforms that had been introduced by William himself only a fortnight after becoming King. The scarlet facings reverted to white in 1843. Sir William Beechey RA was official portrait painter to William IV. Two seascapes flank the fireplace. One is by Willem Van de Velde the Younger (1633 – 1707), considered one of the finest of marine painters, who settled in London after 1673 and was employed by Charles II. This painting, dated 1688, is thought to have been a private commission, and probably shows the various ships commanded during his career by a particular naval officer, with a flagship discreetly in the background. The second is of a fleet including Lord Howe’s flagship, the QUEEN CHARLOTTE, painted by Joseph Nicholls, and given to the Admiralty by Sir Philip Stephens in 1795. The QUEEN CHARLOTTE was launched in 1790and four years later was ‘Lord Howe’s flagship at the Battle of the Glorious First of June. Sir Philip Stephens had served as Secretary of the Admiralty for over thirty years. In 1795, at the age of 72, he resigned his office, but was then created a baronet and appointed as a Lord Commissioner, in which post he served the Admiralty for another eleven years, retiring in 1806 at the age of 81. In the corner of the Board Room stand tall, silver-mounted staffs: the Navy Board Verge. It is a symbol of office, like Mace of the House of Commons, and was carried before members of the Board on state occasions. It was made for the Navy Board in 1786, when it was preparing to move into its new premises in Somerset House; and was brought to the Admiralty Building in 1831, after the Navy Board was in session as a visible reminder of the authority delegated to the Lords Commissioners from the Crown. The Admiralty Verge was returned with due ceremony to Her Majesty in 1964 and is now borne before the Duke of Edinburgh when he acts as Lord High Admiral. At one time the Thames was the principal thoroughfare in London, constantly busy with boats and employing hundreds of watermen. The Admiralty, like many of London’s major institutions, maintained its own barge for the use of the Lords commissioners (as did the Nave Board, whose 18th century state barge survives and can be seen in the National Maritime Museum at Greenwich). It was both a practical form of transport in the days of filthy and crowded streets, and in much use for ceremonial occasion. The barge itself was magnificently cared and decorated, and the oarsmen who rowed it provided with sweeping cloaks and massive silver-gilt badges. State barges remained a common sight on the river until the building of the Embankment rendered their use impractical. The Admiralty kept a single example of a coxswain’s badge, with their anchor and cable in gilt on a red enamelled ground, surrounded by silver scrolls with dolphins, trumpets and sextants echoing similar themes in the over mantel carvings by Gibbons. Of the others in the possession of the Admiralty in 1863, when work on the Embankment began, one each was gifted to the British Museum, Victoria and Albert Museum and the Society of Antiquaries, some were sold, and the remainder sent to the Mint to be melted down and used for seamen’s Long Service Medals. The surviving examples were all made in the 1730s by an experienced London goldsmith, William Lukin, who had been apprenticed in the early official badges of the Royal Naval Reserve divisions. The badge itself was taken to HMS PRESIDENT on 3rd June 2012 for the Diamond Jubilee Pageant, as an appropriate centrepiece to welcome the Queen on her arrival there. 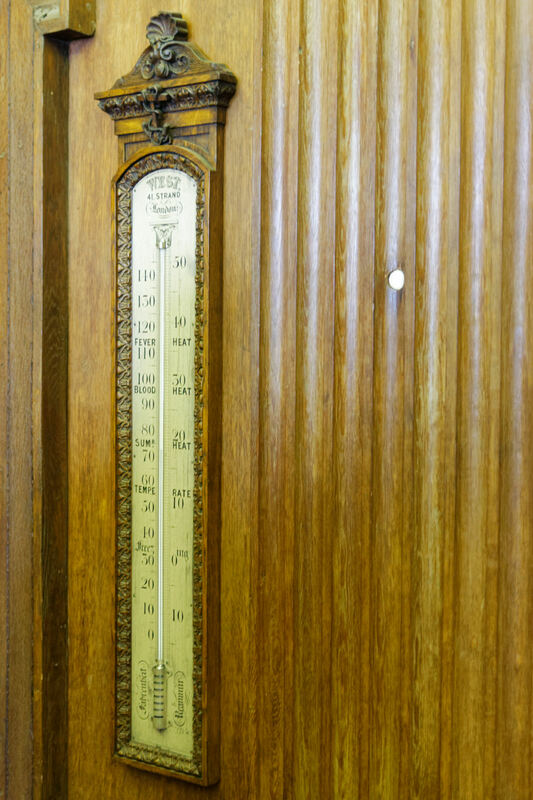 The thermometer and barometer which act as a reminder of the importance of weather at sea were both made for the Admiralty by Francis West, a mathematical instrument maker of distinction, active between 1822 and 1852, with premises in Fleet Street. They are contemporary with Sir Francis Beaufort, fourth Hydrographer of the Navy, who held that office from 1829 to 1855, and is still famous for his wind Force Scale. Beaufort also trained Robert Fitzroy, who, although eclipsed in the public memory by his companion on the second voyage of the BEAGLE, Charles Darwin, went on to be the first head of what became the Meteorological Office and to invent the weather forecast, publishing the first in 1860. The clock, in walnut veneer and gilt-gesso, is older, made by Lanley Bradley, who traded at the sign of the Minute Dial in Fenchurch Street and was a friend of Sir Christopher Wren. It is undated, but probably older than the room it stands in. like the panelling and the carving, it may have been preserved from the 1695 building, but it is also possible that is was inherited from the Navy Board. 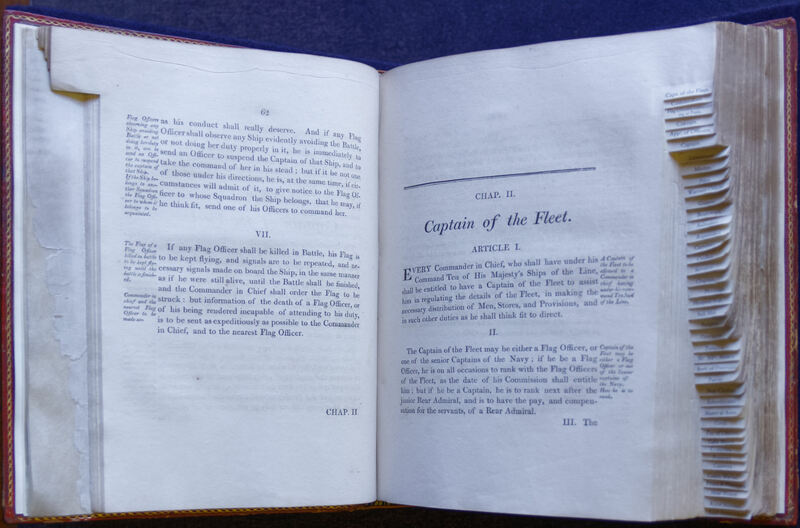 An 1806 copy of the Regulations and instructions relating to His Majesty’s service at sea was a gift to the Admiralty, having originally been Admiral Lord St Vincent’s personal copy. As Sir John Jervis, with his flag in HMS VICTORY, the Admiral had won the battle from which he took his title as Earl in 1797, defeating with his 15 ships a Spanish fleet of 27, less by means of the tactical brilliance displayed at Trafalgar and more from the less spectacular but very effective effort which he had put into the creation of a highly-trained, experienced and disciplined force. He would go on to serve as First Lord of the Admiralty from 1801 to 1804, and proved to be an exceptional administrator. The battle of St Vincent was also the one in which Nelson first distinguished himself, taking his ship out to the line to intercept Spanish ships which might otherwise have escaped (a display of initiative for which he might have faced court-martial had it proved less well-judged), capturing the SAN NICOLAS, and then attacking across her deck a second Spanish ship, the SAN JOSE, which lay just beyond: and extraordinary exploit which became known as ‘Nelson’s patent bridge’. A small model of HMS VICTORY, on loan from the National Maritime Museum, stands by the window. The Churchill Box is a reminder of a later and no less exceptional first Lord. Smoking was always forbidden in the Board room, and, famous as he was for his cigars, even Churchill respected the rule. A small aquatint from The Microcosm of London, published in 1808, based on a drawing by Thomas Rowlandson, depicts a meeting of the Board in a room that has changed in all remarkably little although it shows the bookcase and shelves for globes that were later replaced by the portrait of Nelson, and charts hanging in the place of the wind-dial (which, with the Gibbons carvings, seem to have been moved to a time to the wall where the portrait of William lV now hangs). One of the most spectacular features of the Board Room, shown clearly in the Rowlandson sketch, is the extraordinary ceiling. It is not original. The Room when completed by Thomas Ripley was of a standard height and the ceiling probably similar to those of adjacent rooms. However, in 1786 work began on Admiralty House, and amongst the pages of accounts are details of payment to a “plaisterer” John Papworth, for a large quantity of coving with raking diminished octagon panels. With other details, including work on the adjoining corridor and stairway, it is clear that the Lords Commissioners took advantage of the opportunity presented: the ceiling of the Board Room was raised and grandly decorated: the raking octagons which are its most striking feature are trapezoids made between horizontal lines and lines radiating out from the central point of the ceiling. It has been claimed that no two are precisely identical. Delicate as it is, the plasterwork survived for a century, in spite of the Great Admiralty Explosion of April 1885, which occurred in the ground floor office of Edwin Swainson, Assistant Secretary. The room was wrecked and Swainson himself was seriously injured and had to be invalided out of service. Lord Northbrook, sitting in the room directly above Swainson’s and adjoining the Board Room, was thrown across the room, and his mantelpiece dislodged, and it was lucky that the Board Room escaped damage. The explosion appears to have been due to dynamite, and probably a personal attack on Swainson. In the early hours of Thursday 17th of April 1941, two bombs hit the Admiralty Building, one hitting the western portion of the south Block (one of the extensions built on the old Spring Gardens between 1896 and 1903), and the other falling close by in the quadrangle. The outer wall of the Old Building, including the west wall of the Board Room, was torn from top to bottom and badly cracked, but the structure (for all that it had been denigrated by the RIBGA in the 1880s, when some architects proposed to demolish rather than just extend it) stood firm. The ceiling of the Board Room was brought down, the windows and doors blown in, the panelling and carvings splintered, the sea paintings lacerated and the leather coverings on the chairs ruined, the room filled with debris. It was quickly cleared, the panelling and carvings (in 300 pieces and with a barrel full of fragments) taken down and put into storage and the pictures taken away for restoration, leaving bare brick walls. A temporary plain ceiling was put up, brocade covers hastily put on the chairs, and the Board continued to meet there throughout the war, only moving to a make-shift Board Room in the West Block in November 1946, when proper reconstruction could finally start. The work took almost three years, with the Board Room re-opening in May 1949, almost unchanged, and with the ceiling recreated from the evidence of photographs, prints and the surviving sections of coving. The Board Room had one more narrow Escape in 1955, when at 2 am on 8th December a fire broke out in a part of the Admiralty Building still undergoing war damage repairs and in the hands of Ministry of works contractors. A passer-by reported the fire, and an Irish night-watchman hastily roused Lord Cilcennin, then First Lord of the Admiralty, to tell him that he was surrounded by flames. From the doorway of Admiralty House, Celcennin had a fine view of the flames shooting out above the main entrance and the fire brigade at work with hoses. He was quickly joined by the First Sea Lord, Lord Mountbatten, and his wife, summoned from their flat in Admiralty Arch, and the three stood ankle-deep in water in the courtyard, directing the captain of the fire brigade how to reach the Board Room. The fire destroyed twenty rooms (the walls of Admiralty House uncomfortably hot, Cilcennin reports), and was within a few yards of the board room when it was finally successfully extinguished.